The Cobra 75 is an excellent CB and very convenient with all the controls in the handset. It also saves on space in a very space-limited vehicle. Our install was very simple and took all of about 30 minutes. It wouldn't have taken that long but we tried putting the mic connection on the driver's side of the shifter console and decided we didn't like it there. We subsequently moved it to its current position and have been very happy with it there. 1. Remove all of the parts from the CB box and lay them out. 3. Once you have removed the coin holder, use the metal mounting bracket as a template and mark it for drilling. We used a spade bit that was just slightly smaller than the hole in the mounting bracket to drill the large hole and a regular bit just a little larger than the small bolts to drill the two bolt holes. 4. We bolted the metal plate down and then installed the rubber grommet. Installing the grommet may be the most difficult part of this project. 5. Slide the box under the left-front of the console (just in front of the TC shifter) and pop the coin holder back in place. 6. Run the wires over to the glove box. 7. Crimp the fuse tap on the red wire and the ring terminal on the black wire. 8. Insert the fuse tap into an unused fuse slot. 9. Unscrew the bottom-right screw that holds the glove box trim. 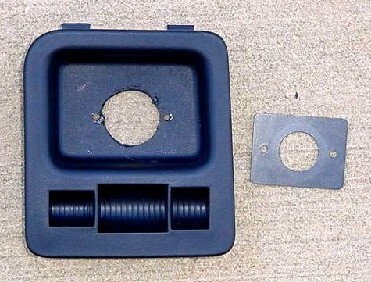 Place the ring terminal between the trim and the metal frame of the glove box and replace the screw. This gives you a good metal-to-metal ground. 10. Use twist ties or wire ties to hold any excess wire out of the way. 11. Mount the box to which the mic and the antenna connect inside the console under the hump just in front of the transfer case shifter. While you cannot see the box in Photo #4, below, it is just to the left of the coin tray under the console. In Photo #3 you can more clearly see the location of the box without the console in place. (It is not necessary to remove the console to install the box. You need only remove the coin tray.) The box is the silver rectangle visible above and to the right of the shifter stud in Photo #3. 1. Using the mic clip as a template mark the hole locations with a pencil. 3. Mount the clip to the pre-drilled holes using the screws provided. Tighten the screws by hand so you don't over-tighten and strip the holes. All that's left is to install your antenna and run the wire from back to front.